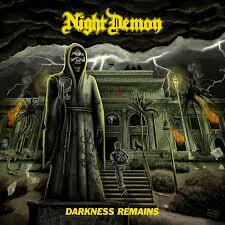 If I can make a suggestion, I’d forget the observations you might have heard or read about ‘Darkness Remains’ being a NWOBHM retread and give Night Demon’s second album your full attention. The band – Jarvis Leatherby (bass/vocals), Armand John Anthony (lead guitar) and Dusty Squires (drums) – are a talented bunch of relative newcomers with a healthy obsession with Iron Maiden and a self-titled EP and album ‘Curse Of The Damned’ already under their bullet belts. What they do – and do well – is distil the essence of traditional British heavy metal and channel it into the present day in the same way as the likes of, say, Enforcer, Cauldron, Vanderbuyst and many other hip young gunslingers. If it helps, the first thing that hit me between the eyes when I first played ‘Darkness Remains’ was the vitality and energy and self-assuredness of The Rods’ self-titled album from 1981; and you have to admit that’s no bad thing in itself. Not a band to mess about, the Americans despatch the album’s ten songs in thirty-eight power-crazed, power-driven minutes. There’s little subtlety on offer, and with enthusiasm and energy running high from start to finish none should be expected; if you cut the musicians in half you’ll find that metal runs right through them. Nor is there a slouch amongst the cuts on offer, but to my mind top honours go to ‘Black Widow’ with its fabulous tempo-change leading to manic closing passage, the wonderfully singalong ‘Hallowed Ground’, and the grandiose album closer and title track, a song which oozes class from every crotchet. The Iron Maiden fascination comes to the fore most prominently in the lyrics of the thrashalong ‘Maiden Hell’ which runs together as many of Steve Harris’s and his bandmates’ song titles as is possible in two-and-a-half-minutes, and in little nods like the middle section of album opener ‘Welcome To the Night’ (where a hint of ‘Rime Of the Ancient Mariner’ is apparent) and the overly up-the-Irons ‘Life On The Run’. But, as I said, this is no copycat band. Night Demon proudly wear their influences on their sleeves – and why not? – and are part of a seemingly endless procession of bands proudly waving the flag for metal in the twenty-first century and garnering new fans to the cause. Someone get them over to Europe because they’ll go down a storm on these shores.